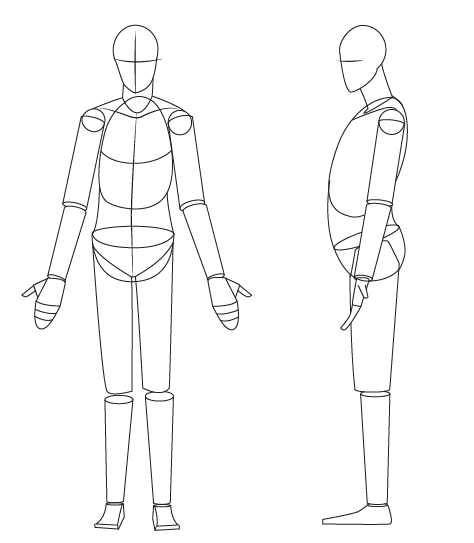 In the examples to the right, you can see that the simplified skeleton is a drawing of the main forms of the skeleton drawn as basic form. The forms are separated into the skull, ribcage, spine, pelvis, and the limbs. The limbs are further divided at the joints into the upper arm, lower arm, upper leg, lower leg, hands, and feet. The limbs can by illustrated using just a line or they can be represented as a thin cylinder. Either is fine, however, the cylinders and help show depth by showing the foreshortening of each cylinder. 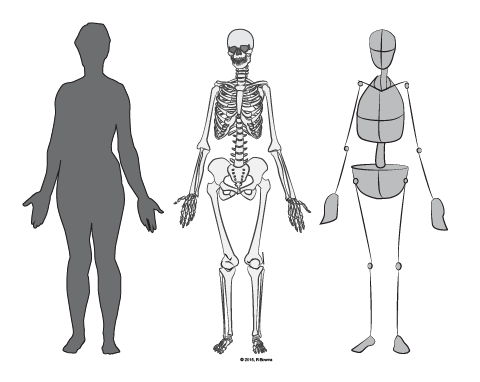 Practice drawing this simple skeleton to learn how the body is structured; as a result, you will learn the relative sizes of those forms, how the forms connect, and where the body can bend. There is no one correct interpretation of the simplified skeleton. To the right are a few examples of different versions of this type of skeleton. Note the different shapes used for the ribcage and pelvis. 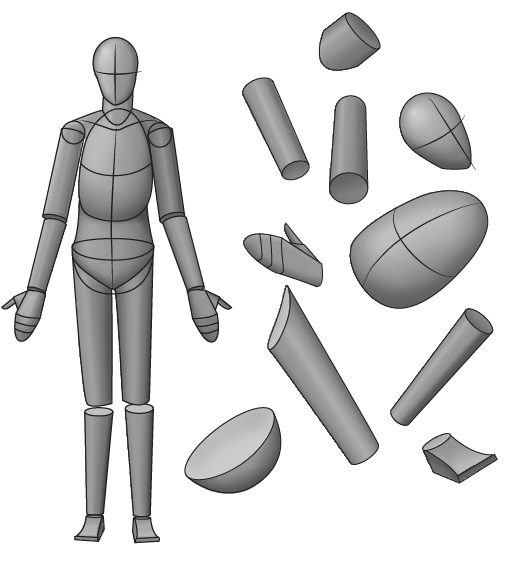 Similar to the simplified skeleton, the simplified figure is a useful technique used to focus on the bigger picture elements rather than the surface details. The main difference between the two is the inclusion of the mass of the limbs and abdomen. This gives us something that looks a little more like a human body. However, the construction of the forms of the torso is basically the same as the simple skeleton. We can think of the simplified figure as just adding to the simplified skeleton. Many artists use the simplified figure when they are drawing from the imagination. If they don’t have any direct reference they can use this to start the process of developing the drawing. 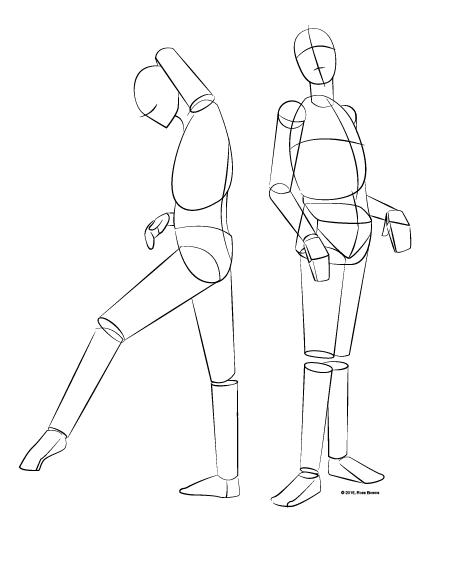 Here are a couple examples drawn to reflect the pose of a person standing. Notice how the gesture still reads as natural even though the details have not been drawn. This is because the forms are positioned as a body would naturally position itself in these actions. 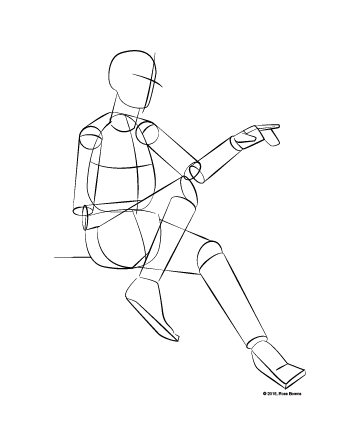 This is an example of a figure sitting. Notice how the simple forms overlap each other. Here is an example of the forms of the simplified figure separated to better show which basic forms can be used. I am only showing one version of each simplified form. As you study and practice this you may find other forms work better in different situations. Finally, this is an example of how the human body can be reimagined as simple forms or how the simple forms fit within the body. 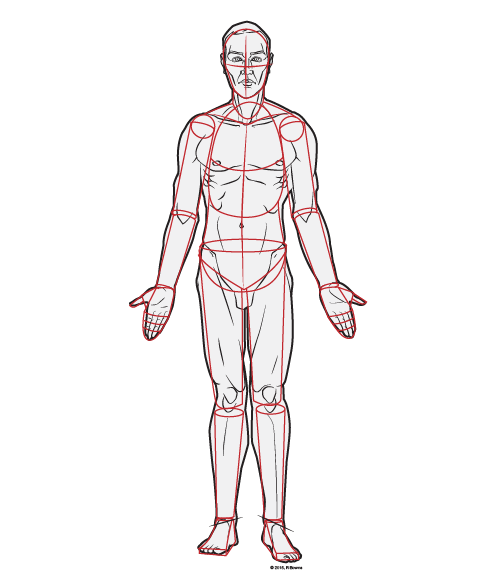 When drawing from a reference or a model it is good to take a look at the landmarks created by the forms to see where the simple forms fit within the body. 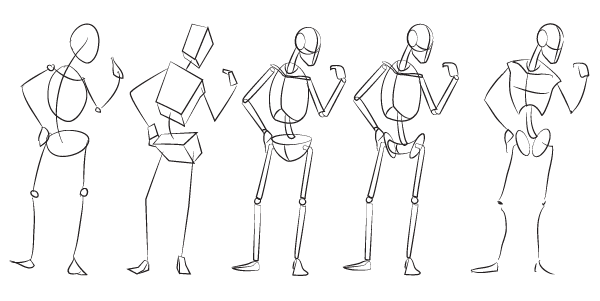 Practice drawing the simplified skeleton or figure. As you do so, you will develop a better understanding of the general structure of the body. 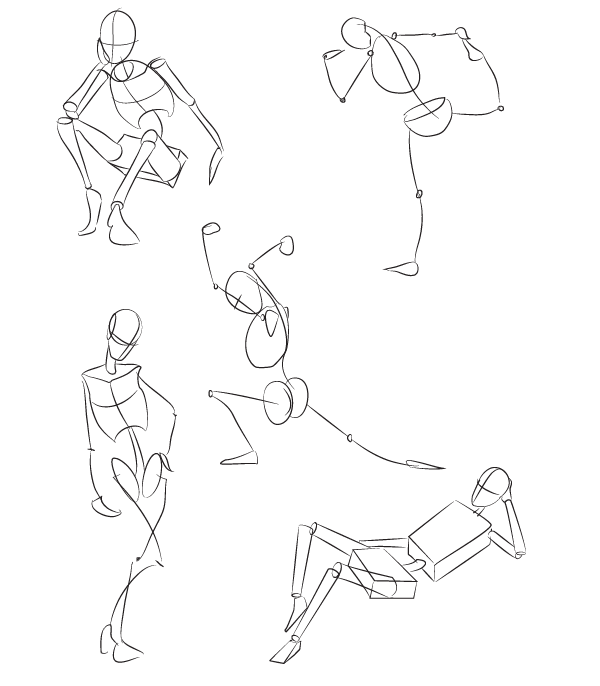 You will be able to create more natural gestures with accurately proportioned figure drawings. This will provide the start to a process of drawing the figure that allows you to work in manageable steps, working on one thing at a time.